I’ve equipped my Blackbird with a complete set of bike-bags by Nonfango, another Italian producer that has recently brought out a new line of bags witch will be shown at the Munich Exhibition. My Honda dealer suggested it because the mounting rack disturbs less the shape of the bike. After waiting a month and a half, I’ve had one of the early sets of the new line: bags "Tuttolaterale" and top case "Tuttoturismo" (I don’t know the English name chosen by Nonfango, but the translation could be "AllSide" and "AllTouring"). The capacity is 42 l. for each bag and 44 l. for the top case; each bag can contain a helmet and the top case can contain a couple of helmets. I reached 210 km/h with bags, top case, magnetic tank bag (and wife) and the stability was still good; I haven’t tried over this speed (Italian motorway speed limits are 130 km/h!) 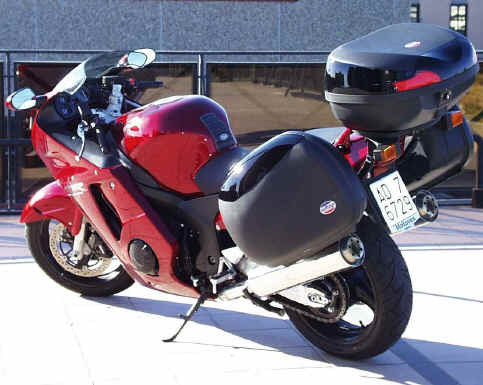 By the way, I’ve heard from Honda Italy that Honda Belgium R. & D. studied a set of bags for Blackbird, but the project was aborted because the bike tend to become unsteady (I think around 280 Km/h J ).